Pieter Bruegel the Elder (c. 1525 – 9 September 1569) was a Netherlandish Renaissance painter and printmaker known for his landscapes and peasant scenes (Genre Painting). He is nicknamed 'Peasant Bruegel' to distinguish him from other members of the Brueghel dynasty, but is also the one generally meant when the context does not make clear which "Bruegel" is being referred to. From 1559 he dropped the 'h' from his name and started signing his paintings as Bruegel. 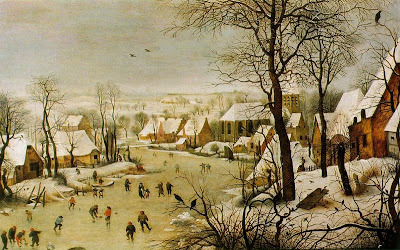 Pieter Brueghel the Younger (1564/1565 - 1636) was a Flemish painter, known for numerous copies after his father Pieter Brueghel the Elder's paintings and nicknamed "Hell Brueghel" for his fantastic treatments of fire and grotesque imagery. Although his precise date of birth is unknown, he was 36 years old on 22 May 1601 and died on 10 October 1636 at the age of 72. Therefore, he was born in late 1564 or early 1565.